Italian leather. Hand Polished sterling silver Four piece buckle set and five crossed golf club ornaments. Strap is Italian Lizard embossed calfskin lined with soft genuine leather. 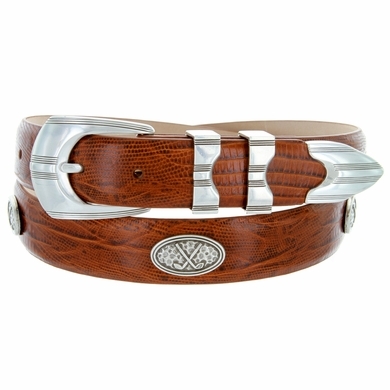 This belt is 1 1/8 inches wide. This item ships same or next business day. No Sales tax for shipments outside of California.